I feel that my music falls in the spaces between strict musical genres. Growing up in Western Massachusetts in the late seventies, I was equally influenced by rock and the American experimental tradition. During my college years I was further exposed to world music (particularly Javanese gamelan) and European medieval music. Most of my musical energies are focused these days on the Ill Wind Ensemble, an improvised music collective performing on traditional and home made-instruments. Otherwise, my current work (when I have time to make it, which is increasingly rare) combines the instrumental textures of vintage analog synthesizers, with shawms and reedpipes from Europe and the Middle East for a sound full of drones and swirling repetition. In the mid-eighties, I attended the Center for Contemporary Music at Mills College, in Oakland, California, where I studied composition and improvisation with Anthony Braxton; Javanese Gamelan with Lou Harrison and Jody Diamond; composition with Charles Amirkhanian and Kenneth Gaburo; and electronic music with David Rosenboom and Larry Polansky. I have performed at festivals and arts spaces across North America, including New Music America in Los Angeles, Expo 86 in Vancouver, BC, the Massachusetts College of Art in Boston, and The Lab in San Francisco. My music has been aired on KPFA Pacifica Radio in Berkeley [and, ed. 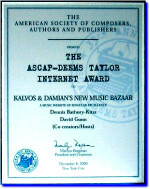 note, on Kalvos & Damian]. Scores for my gamelan music are available through the American Gamelan Institute, Box 1052, Lebanon, New Hampshire 03766.